Covina Truck Accident Injury Lawyers – Your Trusted Partner in Personal Injury and Wrongful Death Accident Claims in Covina, California Need An Experienced Truck Accident or Car Accident Personal Injury Attorney In Covina? Our Covina truck accident lawyers and law firm provide legal services for those injured in truck accidents, car accidents, motorcycle accidents or other accidents in Covina, Los Angeles, the San Gabriel Valley and all of California. If you were injured or lost a loved one in a truck crash or other accident, we can provide expert legal representation and support for your personal injury claims and wrongful death claims in Covina, California, a small city located in Los Angeles County, California. Our Covina truck accident and wrongful death accident attorneys are known for providing expert personal injury legal services for those injured in truck crashes and for the relatives and families of those killed in a truck and other fatal accidents for wrongful death claims. If you have been in a truck accident or other personal injury claim in Covina, Los Angeles or anywhere else in California, you can contact us now for an absolutely and completely FREE CONSULTATION. In addition, you can find helpful information on truck accident cases and wrongful death claims on our website. You can get more information about our Covina & Los Angeles truck accident personal injury & wrongful death lawyers and law offices by visiting our home page, our lawyer profiles, and our personal injury & wrongful death case testimonial pages. For more specific information about your own case, simply click here to contact us or call us now at 818-222-3400 or 866 INJURY 2 (after hours, please dial 1). Covina is a small city in Los Angeles County, California, approximately 22 miles east of downtown Los Angeles, in the San Gabriel Valley region. Covina is surrounded by San Dimas, Azusa, Pomona, Glendora and Charter Oak, located in the San Gabriel Valley. According to the 2010 United States Census, Covina has a population of 47,796. When a truck or car driver’s negligence causes an accident resulting in the death or injury of others, the driver may be legally obligated to compensate the victims or their families. The owner of the truck, car or other vehicle driven by the negligent driver and/or the driver’s employer, if the driver was in the course and scope of his employment, may also have liability and financial responsibility for such accidents. 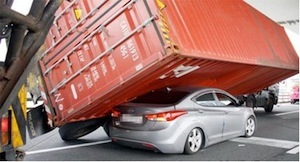 The carelessness of the truck driver can be due to several reasons; and it can be imputed to the driver’s employer and owner of the truck or other vehicle by California law. Our truck accident personal injury lawyers and Law Offices can explain how this work in relation to the facts of your particular case and also provide legal assistance to get your family and you the rightful help and compensation for your damages, whether physical, emotional and/or financial. Truck Accident Personal Injury Lawyers – Over 40 Years of Experience! Our truck accident personal injury attorneys, legal team and Law Corporation have recovered more than $100,000,000 in compensation for our clients. Our personal injury lawyers have spent more than three decades resolving car accident, truck accident, personal injury and wrongful death claims in Covina, the San Gabriel Valley, and throughout Los Angeles, the San Fernando Valley, Ventura, Riverside, San Bernardino and all of California. To learn more about how we can assist you further, and what you need to do to protect your rights and to comply with legal procedural rules and strict time deadlines, we urge you to call us at 1-866-INJURY 2 or 866-465-8792 or 818-222-3400 (after hours, press 1) for a FREE, no-obligation consultation. Alternatively, you can easily email us at info@WalchLaw.com or just use our easy contact form to tell us about your case. Completely FREE Consultation: NO fee until you WIN!